Railway Jobs: Railways Group D Recruitment 2018, RRC/Railway Recruitment Cells has given Special Recruitment Drive notification for Group ‘D’ posts. Online applications are invited from eligible Persons of Indian Nationality for the erstwhile Group ‘D’ posts. Applications complete in all respects should be submitted only ONLINE to the concerned Railway Recruitment Cell till closing date. Online Applications, Qualifications, Last dates for applying, Online Exam Date, How to apply and post details are given here. Railway Recruitment Boards invite ONLINE applications from eligible candidates for the recruitment of various 7th posts in Level 1 of 7 CPC Pay Matrix for the vacancies in various units of Indian Railways. Applications complete in all respect should be submitted ONLINE ONLY to any one of the Railway Recruitment Boards before 23.59 hrs of 12.03.2018. Railway Group D Recruitment 2018 to fill 62907 vacancies will begin 10th February 2018 on the official website of Indian Railways - indianrailways.gov.in. The Regional Railway Recruitment Boards will host the information as well as the application process tomorrow onwards and candidates interested in pursuing career with Indian Railways must apply online on the regional website on or before 12th March 2018. As per the latest employment news, Railway Recruitment Board will open the application window against Advertisement number CEN/02/2018 and commence a mass recruitment drive across various regions. The selected candidates will be placed in Level 1 of the 7th CPC pay matrix. The Railway Recruitment Board (RRB) has invited online applications from eligible candidates for Group D posts in level 1 of 7th Central Pay Commission (CPC) pay matrix in various units of Indian railways. The application process begins on February 10 at 10am and will close on March 12, 2018. The number of vacancies to be filled through this recruitment process is tentatively 62,907. The various posts to be filled are: Track maintainer Grade IV (Trackman), Gateman, Pointsman, Switchman, Helpers in electrical/engineering/mechanical/signal and telecommunication department, porter etc. Candidates applying for the job (sarkari naukri) should be between 18 to 31 years as on July 1, 2018. Relaxation in age will be provided as per the notification. Candidates should have passed Class 10 or ITI from institutions recognised by NCVT/SCVT (or) equivalent (or) should have a national apprenticeship certificate (NAC) granted by NCVT Or Class 10 pass plus national apprenticeship certificate (NAC) granted by NCVT (or) 10th pass plus ITI from institutions recognised by NCVT/SCVT. The selected candidates will be offered Rs 18,000 per month as salary plus allowances. Note: The detailed advertisement can be seen in employment news dated February 10-16. The applicant must fall in the age bracket of 18 to 31 years. Age-relaxation is applicable as per government rules. The selected candidates will be eligible to receive a monthly salary of ₹18,000 per month + allowances as per 7th CPC Level 1. How to Apply: Candidates to go to the RRC/ NR website provided for filling online application. Candidates are required to go to the RRC/NR website rrcnr.org provided for filling ONLINE application and fill up the personal details/BIO-DATA etc. carefully. Last date for online application: 12.03.2018. Date of online examination(CBT): Tentatively scheduled during April and May, 2018. About Recruitment: Indian Railways has come up with another major recruitment drive; for 62907 vacancies for Group D posts: Track Maintainer grade IV (Trackman), Gateman, Pointsman, Helpers in Electrical/ Mechanical/ Signal & Telecommunication departments, porter, etc. Candidates in the age group of 18-31 years who have cleared class 10th with (or without) ITI or NAC in the relevant trade are eligible to apply. As of now official websites of the RRBs are not carrying any such updates. Candidates are urged to wait for the official notification in this regard which, as per the reports, will be available at the official websites and the coming edition of Employment News. 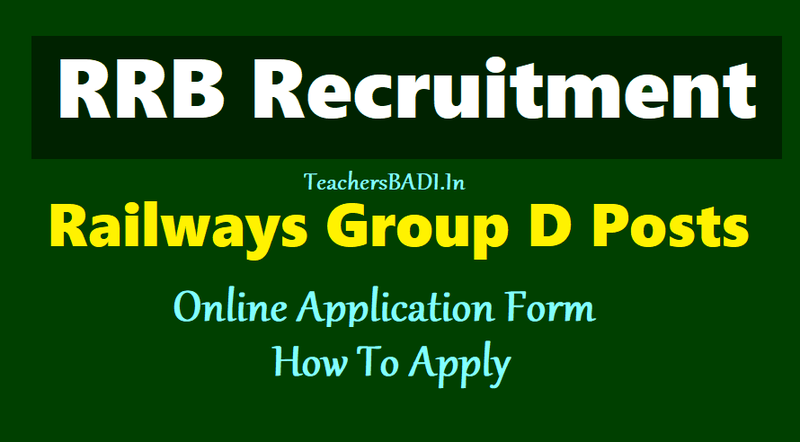 READ | RRB Group D Posts Recruitment 2018 Online Application form, How To Apply? Railways have advertised for the recruitment through notification number CEN 02/ 2018. On 3 February 2018, RRBs had released official notification CEN 01/ 2018 for more than 27000 Assistant Loco Pilot and Technician posts. Online registration for the same has begun and will continue 5 March 2018. Candidates will be selected on the basis of their performance in computer based test (two stages), computer based aptitude test and document verification. 'The date, time and venue for all the activities viz First stage CBT, Second stage CBT, Computer Based AT and DV or any other additional activity as applicable shall be fixed by the RRBs and shall be intimated to the eligible candidates in due course.' Online registration will, supposedly, begin tomorrow (10 February 2018) and the last date for submission of applications is 12 March 2018.